As reported at NewsBusters , on Thursday’s The Situation Room, Jeffrey Toobin slammed Cruz’s comments about “New York values” as a “derogatory term” about Jews which amounted to nothing more than an “old-fashioned” “anti-semitic trope” from “a hundred years” ago. Jeffrey Tobin is not only wrong but he should be ashamed of himself of using a fake charge of anti-Semitism as a political tool. Compounding the issue is the fact that Toobin is Jewish and as a Jew, he should know better. Out of the five candidates in still running in either of the major parties, Ted Cruz is the most supportive of Jews and Jewish issues. From the moment he arrived in the senate, Cruz battled the President‘s anti-Israel policies and unlike Democratic Party supporters of Israel, Cruz battled Obama loudly and very publicly. During the hearings to confirm Chuck Hagel as Secretary of Defense, Ted Cruz eviscerated Chuck Hagel for his statements on Al Jazeera claiming that Israel committee war crimes. Senator Chuck Schumer a Jew but a Democrat supported the Hagel nomination. But even more than his actions for the Texas Senator (as with most Evangelical Christians) supporting Jews is not a matter of politics, it’s a matter of faith which is taught in religious schools from the time they are very young. What he [Trump] does have is a liberal agenda, one that embraces abortion on demand, the abolition of gun rights, higher taxes, contempt for the cops, controls on what people eat and drink, and the dumbing down of the city’s children in failing public school, just to name a few of the things on his list. These are the kinds of things Cruz meant when he referred to “New York values,” values that are just too liberal for most of the nation to swallow. While it may not be clear that assessment is accurately applied to Trump – the jury is still out in many respects – it is absolutely clear that Cruz was not speaking of Jews, Judaism or anything else having to do with the oldest of the Abrahamic religions. He was talking about liberals and liberalism of the kind that never, ever plays in Peoria. (…) But back to Cruz and the suggestion now being made in the darker corners of the Internet that he’s somehow a closet anti-Semite; balderdash. It was a poorly chosen phrase but not a racist code word. Those who suggest otherwise are throwing something against the wall, hoping it sticks. In September 2014 Ted Cruz delivered a keynote address to “In Defense of Christians,” an advocacy group aiming to bring attention to the plight of ancient Christian communities in the Middle East, and to protect the rights of other religious minority groups in the region. With that Cruz had enough, “If you will not stand with Israel and Jews” he said, “then I will not stand with you. Thank you and God bless you.” And he left. If Ted Cruz is an anti-Semite why did he hire Jews as his closest advisers? His Chief-of-Staff Paul Teller is a Long Island Jewish boy like me, and his Deputy Chief-of-Staff Nick Muzin is an Orthodox Jew and a graduate of Yeshiva University. In March 2015, IJ Review published a photo-essay of Senator Cruz’s office. They pointed out the Gadsden Flag in the picture below, however more interesting (at least in judging Senator Cruz’s attitude toward Jews) is the traditional seven-candle Jewish menorah. 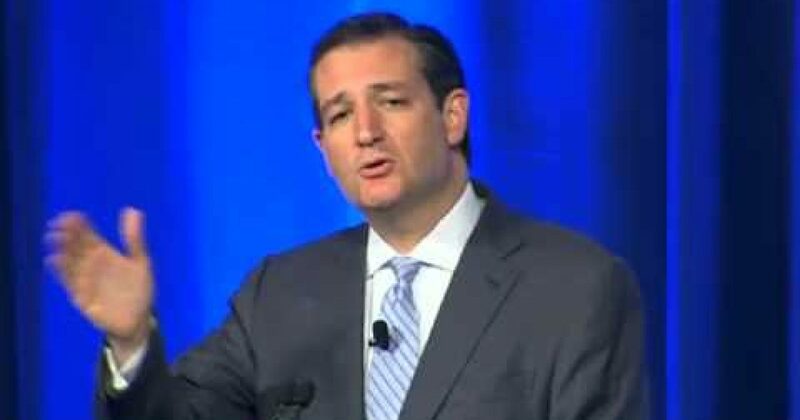 The video below shows Senator Cruz’s appearance at the “In Defense of Christians,” conference.